Russian Talmudist; lived at the end of the eighteenth century; reputed pupil of Elijah b. Solomon of Wilna, and of the latter's pupil, Ḥayyim b. Isaac of Volozhin. He wrote a number of letters, published under the title "Maẓref ha-'Abodah" (Purifier of the Ritual; Königsberg, 1858; Munkatsch, 1890), containing an alleged correspondence between Benjamin and the friend of his youth, Joseph of Nemerow, on the subject of Ḥasidism. In the first letter Benjamin asks his friend for information concerning the movement, his investigations not having enabled him to understand how Ḥasidism could presume to change the old laws, and to conform them to the rules of the Cabalists, particularly of Isaac Luria. 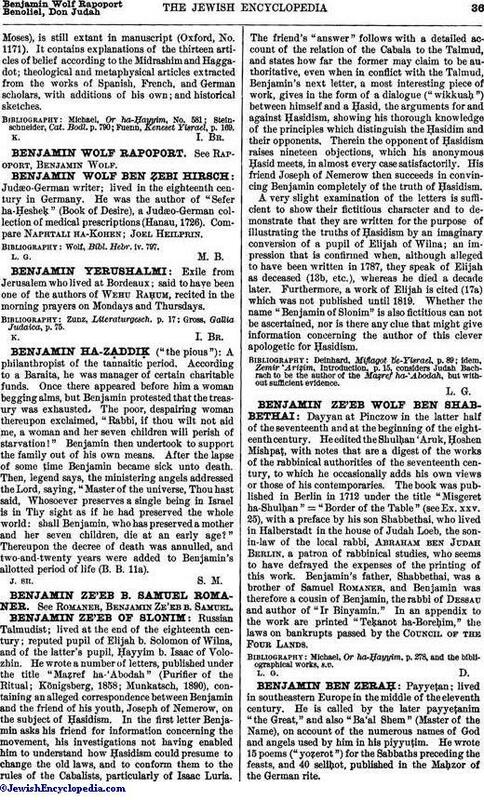 The friend's "answer" follows with a detailed account of the relation of the Cabala to the Talmud, and states how far the former may claim to be authoritative, even when in conflict with the Talmud, Benjamin's next letter, a most interesting piece of work, gives in the form of a dialogue ("wikkuaḥ") between himself and a Ḥasid, the arguments for and against Ḥasidism, showing his thorough knowledge of the principles which distinguish the Ḥasidim and their opponents. Therein the opponent of Ḥasidism raises nineteen objections, which his anonymous Ḥasid meets, in almost every case satisfactorily. His friend Joseph of Nemerow then succeeds in convincing Benjamin completely of the truth of Ḥasidism. A very slight examination of the letters is sufficient to show their fictitious character and to demonstrate that they are written for the purpose of illustrating the truths of Ḥasidism by an imaginary conversion of a pupil of Elijah of Wilna; an impression that is confirmed when, although alleged to have been written in 1787, they speak of Elijah as deceased (13b, etc. ), whereas he died a decade later. Furthermore, a work of Elijah is cited (17a) which was not published until 1819. Whether the name "Benjamin of Slonim" is also fictitious can not be ascertained, nor is there any clue that might give information concerning the author of this clever apologetic for Ḥasidism. idem, Zemir 'Ariẓim, Introduction, p. 15, considers Judah Bachrach to be the author of the Maẓref ha-'Abodah, but without sufficient evidence.